Which payment gateways are available in the script? How can I restrict the advertiser to use the bonus, only if, fund is added to the account? Can I use the same adcode in multiple locations in a single page? CPM ads not displaying in publisher sites? Statistics are not working properly? How can I display the logo of my user/client in the home page of the admarket site? How can I refund to advertiser? 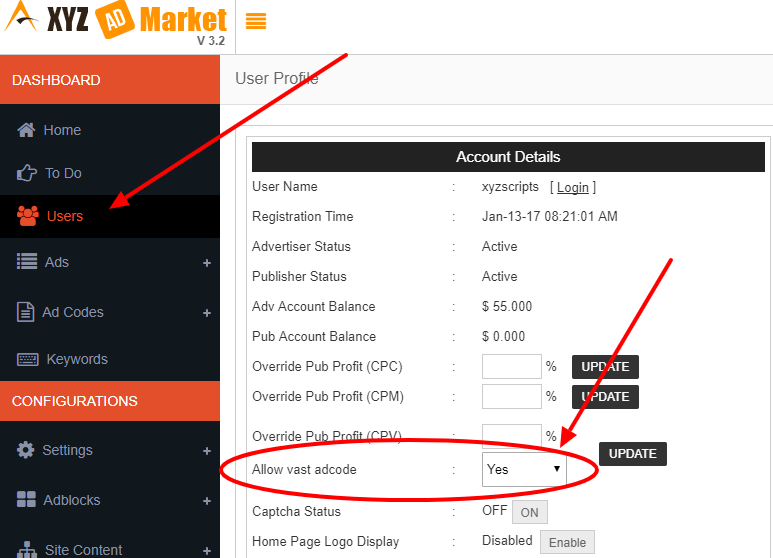 How can I configure external theme in XYZ Admarket? Click the “Install Now” button in the “Manage Addons” page. 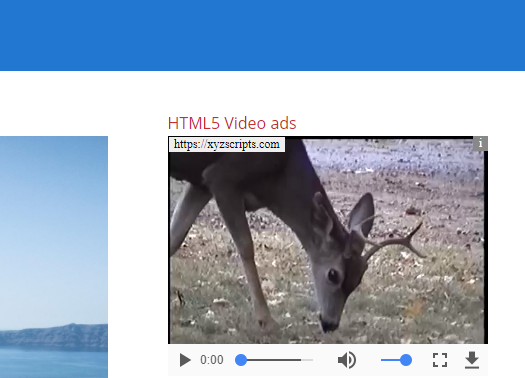 If it is not working, please upload the VAST and HTML5 Video Ads Addon to the “addons” folder in XYZ Admarket script. Now activate the “Video Ads” addon. You can enter the settings here. 1. Minimum CPV Rate – This is the minimum Cost Per View Rate and it is the rate for single view. 2. Publisher Profit Percentage – This is the profit percentage given to publishers. 3. Valid CPV Impressions Per Ad Per IP – This is the valid CPV impressions for a particular time period per ad per IP. If the value is 5 impressions/ 1 hour, it will count 5 valid impressions for 1 hour period. 4. Video File Max Size – This is the maximum size of the video file in MB. 5. Video File Max Duration – This is the maximum duration of the video ad file in seconds. 6. 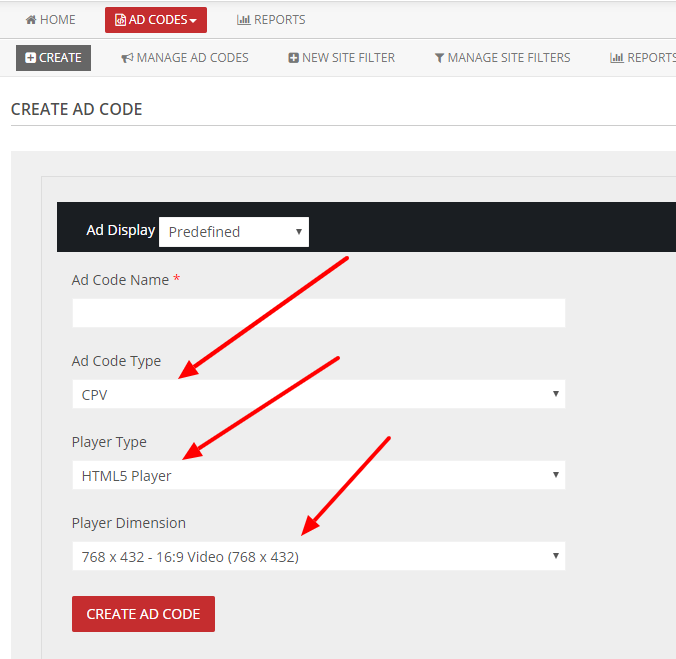 Supported Adcodes – We can select VAST video ads and HTML5 video ads here. VAST ads are the video ads displayed in the video players as pre-toll, mid-roll and post-roll. HTML5 video ads are the video ads just like the banner ads in a webpage. 7. 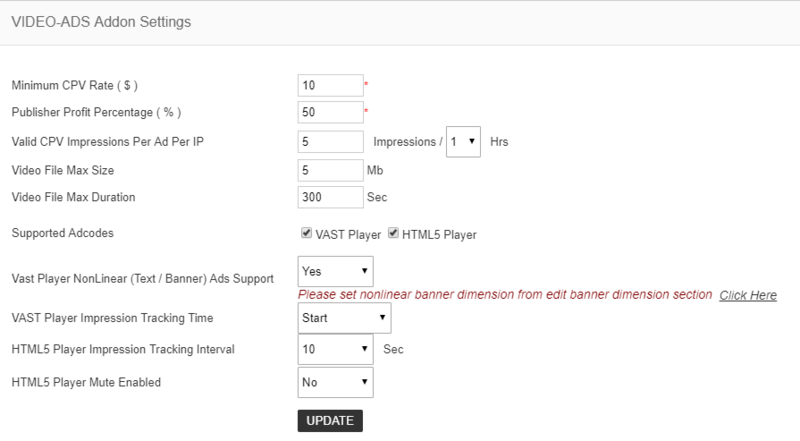 Vast Player NonLinear (Text / Banner) Ads Support – We can enable/disable this option. If we have enabled it, we can display the text/banner ads in the VAST player. 8. VAST Player Impression Tracking Time – This is the time where we want to track the impression. If this value is start, the impression is counted of starting the video ads. If it is “complete”, the impression is tracked on video ad complete. 9. HTML5 Player Impression Tracking Interval – This is the interval for the tacking of impression in HTML5 ad. 10. HTML5 Player Mute Enabled – We can setup the mute option here for HTML5 player. 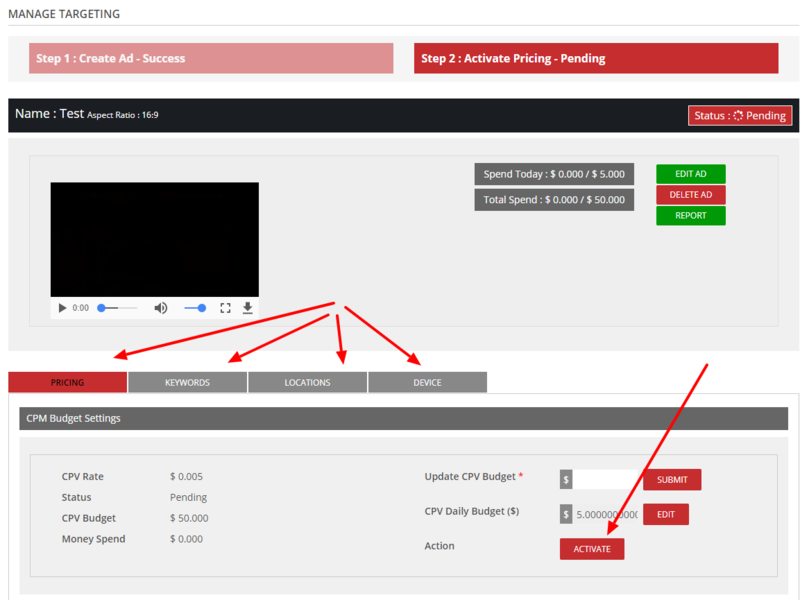 In this section we can setup the aspect ratio of the video ads. In this page we can see all the aspect ratio and can edit or delete it. Click the “Add” button to add a new aspect ratio. 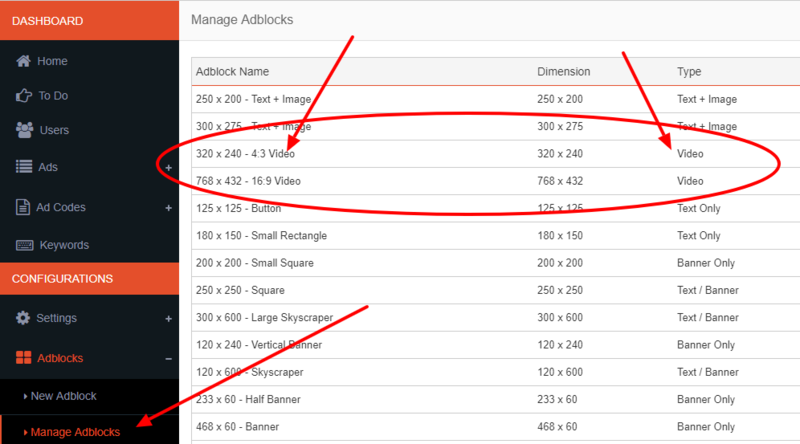 With the installation of video ads addon, 2 video adblocks for HTML5 ads are created automatically and we can see it in the “Manage Adblocks” section. Click the “New Adblock” to create a new video adblock. Here select the ad format “video only” and enter the width and height. Note: The VAST adcode is NOT AVAILABLE for all publishers by default. Admin need to go the “Users” section and select the publisher who want the VAST adcode and in the profile, allow to use the VAST adcode. 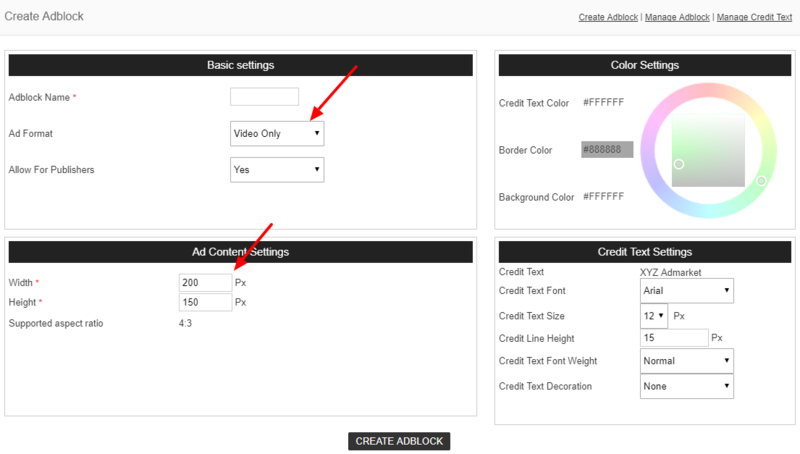 In the advertiser section when creating a new ad, advertiser can add the video ad. Here advertiser can upload mp4,flv,wmv,mpg,avi,webm,ogg extension videos. Advertiser can also set the keyword targeting, location targeting, device targeting etc. in this section. In the publisher section publisher can create HTML5 video adcode. Note: Publisher can create the VAST adcode if admin allowed this for the publisher in his profile. In the adcode creation section publisher can select the adcode type CPV and select the player and player dimension. 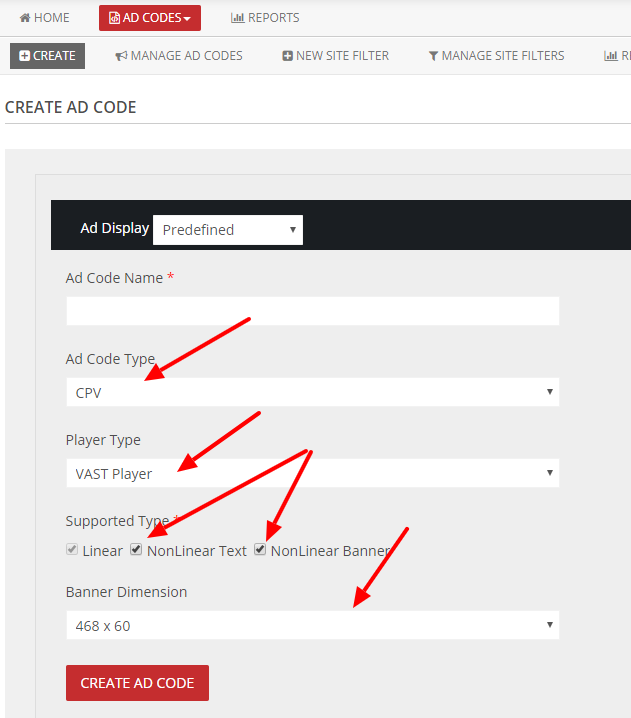 After selecting the option click the “Create Ad code” button and we will get the adcode. Use this adcode in the web page and the HTML5 video ads will display in the webpage like the below image. For the VAST Adcode, publisher can select the non linear text and banner ads too. 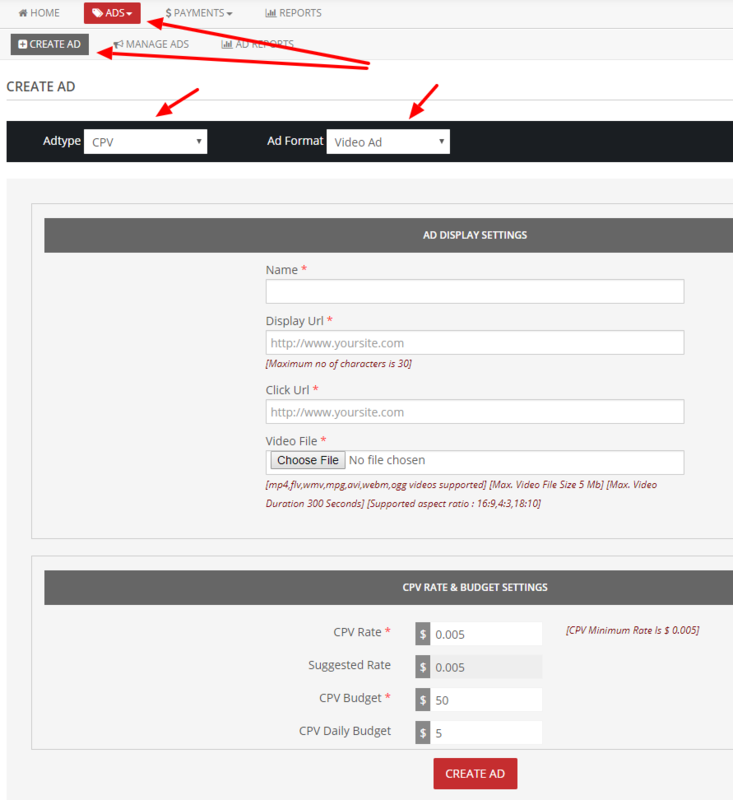 After selecting the option click the “Create Ad Code” button and you will get the vast tag url. You can copy the vast tag url and use it in the pre-roll, mid-roll or post-roll settings of your vast player. It will show the vast video ad in the player before, middle or after the original video like in youtube. Also it will show the non linear text or banner ad in the player based on the player. Note: The non linear ads are not supported in all VAST video players. Please check your player features for this.